Spectacular views from this 2100 square foot home. A reverse floor plan gives you a 180 degree view of the Pacific Ocean whether you are in the living room, dining room, or kitchen. The upper living room has a fireplace and LCD TV. The extended dining area has a wet bar, stereo/CD player, and the access to the upper deck. This comfortable furnished home also has a TV/game room on the lower level with the two remaining bedrooms and bath. The lower deck contains a large hot tub that is picture perfect for vacation time. Just off the lower deck is your private 'volleyball' beach area. This home was built in 1992 and has all modern appliances with natural wood accents throughout. Your vacation home is just 50 yards from the main beach. It is an easy, flat, sandy walk. The home is centrally located in the town of Rockaway beach and the 7 mile sandy beach between Tillamook bay and Nehalem Bay. This home is managed by the owner. Keywords: Vacation Home, ocean front, ocean views. I own and manage only 3 vacation homes. It is a pleasure to share my homes with others as they are all unique. I designed and help build this home from the sand up. I will work with you to make sure you enjoy your vacation. Our family has vacationed in Rockaway beach for 2 generations. We built this home in 1990 for our personal use. The beach is the best on the Oregon coast and it is our pleasure to share this with others. We really enjoy countless hours of playing beach volleyball on our private beach. Our daily schedule would include: Sun bathing, playing in the ocean, enjoying the hot tub or having cocktails after a game of golf. We also just watch the waves continually roll in. Very comfortable and relaxing home. A short(50 yard) flat walk from the deck. Truly right on the ocean with no streets, streams or any blockage. Great views of the ocean while sitting in the hot tub. Beautiful house! My family had a fabulous time!! We enjoy the house. The house is pretty beautiful great location. We love the big deck and the sand right of the deck. The kids had a great time playing in the sand. We would totally stay again there. Thank you For sharing your beautiful house! Breath taking views from the upper level. 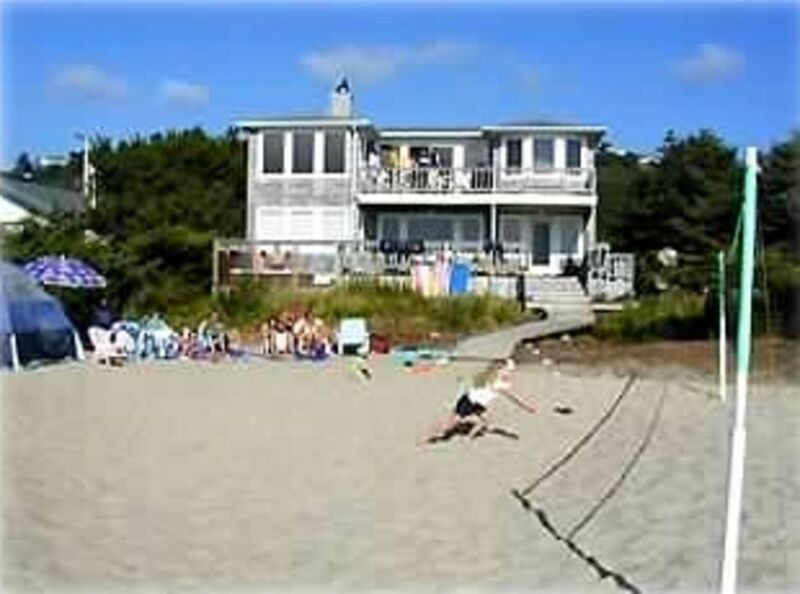 Lower level provides direct access to the beach. We had 4 adults and 2 children and had ample room. House was well stocked. Hot tub a bonus. A wonderful setting to ring in the New Year! Extremely clean and exactly as presented. Beautiful view and very comfortably furnished. Beach access was easy, as was parking. Did not open hot tub due to cold rainy weather. Small suggestion would be to empty one cabinet shelf for guests to place their food. The location is superb, within walking distance to the town. My husband and I stayed here and it was super spacious! I could definitely see both of our families staying here comfortably. At first, I was a little apprehensive being right next to the road, but the house really drowned out the noise. I loved the backyard sand area, it felt very private. The hot tub was a nice added bonus and was very easy to use. Overall, we can't wait to book our stay for next year! The whole family stayed and played. Awesome time. Great location. Had a blast with family and friends. Nice house, lots of room, great view,and close to stores and shops. Fishing and Crabbing charters available within 5 miles. Rockaway Beach is 7 miles of sand between the Tillamook & Nehalem Bay. This is a NO PET, NO SMOKING home. All payments are non-refundable unless I can re-rent the time and you will be reimbursed that amount.